We have created a visual experience to help customers better understand the size, look & feel that can be created, altered or redesigned to fit your project. 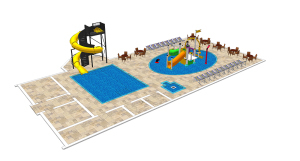 Our complete packages are designed based on square footage and can be used as is or customized to suit your needs. Not sure which package is right for you? Contact us to learn about the perfect solution for your hotel. 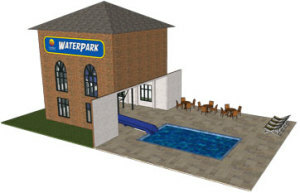 Change your pool from a non-performing asset into something that attracts more customers!! We have created a pre-fabricated turret allowing the addition of a slide to a pool area with low ceilings and minimal deck space. The minimum height required to install a Super Squirt slide is 24’ with a 24’ x 24’ foot print. 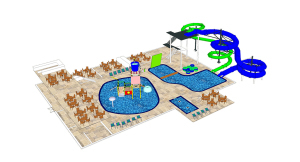 Our design will help make it easy to bring your pool area to life and attract customers away from your competitors thus increasing your occupancy and ADR. 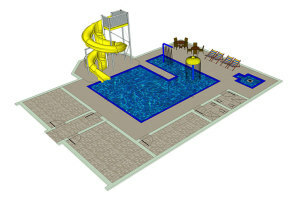 The Super Squirt can be built with a run out or empty into your existing pool. Perfect for hotels with limited space! 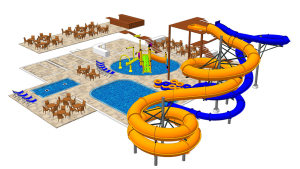 Similar space to a standard hotel pool, this package includes our most popular ride the Super Squirt, it includes a shallow area and spray elements. Party, fitness rooms allow the facility to host birthday parties and family gatherings. This two phase plan allows the developer to build the first phase of 15,000 sq ft which provides everything you need in a small park and then add when the business is ready. Planned phased development is a good business strategy to reduce initial capital investment, re-pay debt before adding more and protect you from competition.